Posted: Sunday, June 3, 2018. 6:30 pm CST. 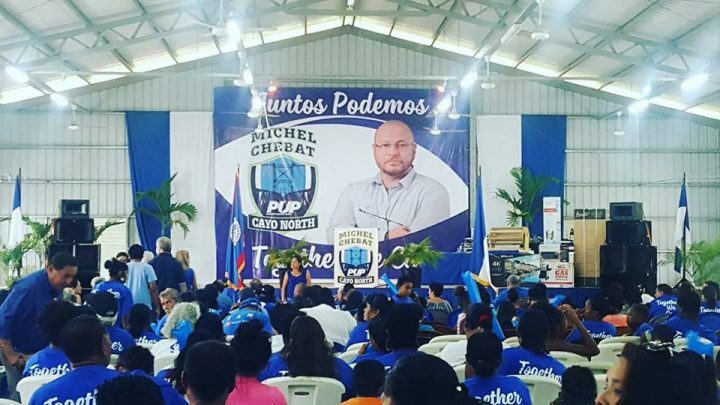 By BBN Staff: This afternoon, over a thousand supporters of the Opposition People’s United Party (PUP) gathered at the Octavia Waight Center in San Ignacio to endorse Attorney Michel ‘Micho’ Chebat as the standard bearer for the Cayo North division. The PUP has been hosting a series of endorsement and contested conventions throughout Belize in an effort to establish all standard bearers for the party to prepare for the next general elections. Present at the convention were Florencio Marin Jr, Kareem Musa, Mike Espat, Ramon Cervantes and PUP Party Leader, John Briceno. At the event, Chebat shared some plans for the constituency including an upgrading of the San Ignacio Hospital- from a clinic to a fully functional hospital with all the facilities and services made readily available to the public. Chebat also explained that it is crucially important for land and affordable housing to be made available for all Belizeans. Briceno expressed his full confidence in Chebat and assured a victory for the PUP in Cayo North when the next general elections are called. Omar Figueroa of the UDP is currently the area representative for that division.